There are no rules to this sport… As with stand up paddle boarding on water land paddling is still fledgling and as such there are many paths to follow. Here at SUPM/Land Paddle UK we’ve experimented with a variety of different land SUP craft but none as unique as Razor’s Ripsurf. Coming as a two wheeled castor shaped mini-surfboard – complete with progressive rocker, deck flex and tail kick pad – Razor describe the Ripsurf as perfect for land based surfing mimics. Being able to slide/ride full 360*, due to the rotating castor wheels, anyone stepping aboard for the first time will certainly discover a new sensation of sliding. We’ll be honest, it’s not for everyone. Many who we showed the Ripsurf declined to get onboard – mainly for fear of stacking it into the concrete. And while we’ll readily acknowledge there’s a trick to pushing off and beginning the slide, with confidence (and self-belief) it’s easier than you think. 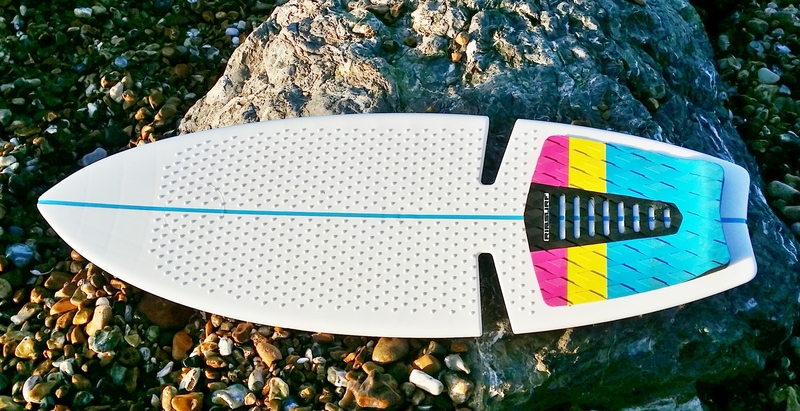 Land paddlers are in a unique position with the Ripsurf. Your paddle is the perfect aid (read crutch) for initially getting going. It may not be the correct technique but placing the Ripsurf on its side, angling feet accordingly and using your stick to begin forward momentum is a quick and easy way to be up and riding. There needs to be a degree of flex with ankles to achieve this so our advice is warm up prior to your session. The correct method is somewhat different. With both wheels facing forwards (they’re angled such that naturally the Ripsurf’s wheels will face forwards) riders place their front foot across the board’s centre line. Then with a firm push (not too hard) forward propulsion is achieved, the rider’s back foot following quickly and locating the rearward placed kick pad. This last point is vital! Being super short in length it’s all too easy to push off, the trailing leg moving in the same direction, but missing the board completely! This usually results in the splits. Therefore using the back kick pad as a locater is a way to ensure your foot placement is correct. If you look at the accompanying video you can see the technique required. Something that really surprised us is how little speed you need to be moving for efficient balance on two wheels – it’s not much at all! As long as feet remain across the Ripsurf’s centre line the bare minimum of forwards thrust is enough to keep you level and rolling. As momentum decreases riders will feel the point they’re about to be tipped off. In this instance a wiggle (more on this in a mo) or paddle push will increase speed and help once again with balance. So, as mentioned above there’s a sort of wiggle technique to keeping the Ripsurf going – without your paddle in the mix. Keeping upper bodies lock stock still legs and hips are free to pivot side to side, thereby allowing the Ripsurf to continue its run without having to take feet off the board. Be under no illusion, this is a work out! And leg burn sets in fast. At which point whack in a few paddle strokes to give yourself a rest. (See vid again for evidence of this). Razor’s Ripsurf really comes into its own when you start practising carves and turns – even more so if there’s a ramp, undulation or some vert in the mix. In this instance it pretty much replicates the feeling of being on a wave – especial those who love busting loose, sliding the tail (especially) and getting radical. If you’re in this camp then you’ll be familiar with the consequences. We’ll not lie, stacking it from on high should ensure riders need to be tooled up with lids and pads to avoid injury. But, it’s a super fun sled for scooting round skate parks and progressive/aggressive riders will love the terrain Razor’s Ripsurf opens up. If you’re not fond of the above then you can still benefit from the loose riding nature of the Ripsurf. With a bit of speed in the mix, and a finesses riding style – something that’ll come with time spent on the board – land paddlers can achieve super tight carves across the flat. As with everything you’ll need some hours under your belt practising and getting used to the Razor Ripsurf’s fundamentals. But with perseverance a whole new world of land paddling will open up to those ready to embrace. Razor’s Ripsurf is unique among the world of land paddling with its two castor wheels and unique riding experience. Such is the board’s design carving and getting radical with turns is what the RS is all about. Anyone taking it to vertical concrete or wood (ramps and bowls) will have yet another dimension added. It’s a superior sled for this kind of ripping. Flat land paddlers looking to cover distance will find longer land paddling boards a better choice. Those who favour tight carves and practising tail slides will, however, love it. Time spent initially will allow newbie Ripsurfers to understand the correct starting technique and get to grips with the ‘wiggle’. While off putting at first (we’ll admit two wheels looks like circus skills will be needed to balance) Razor’s Ripsurf is easier to get up and running, with a bit of positive mental attitude and confidence, than you’d think. Thanks to Charlotte Bird at recreationltd.co.uk for helping with this article.